French toast is one of my husbands favourite breakfast foods. He has a long history of making and eating it from the age 11 in fact. I on the other hand am not as big a fan. It’s not that I don’t like it, because I do but it’s just not my favourite thing to eat for breakfast. I find it time consuming to make and a bit to decadent for an everyday kind of breakfast. I’m also not a fan of making it because I think it’s messy and too much trouble. If I had a choice I would rather make pancakes from scratch than make French toast. That is why I love making overnight French toast. 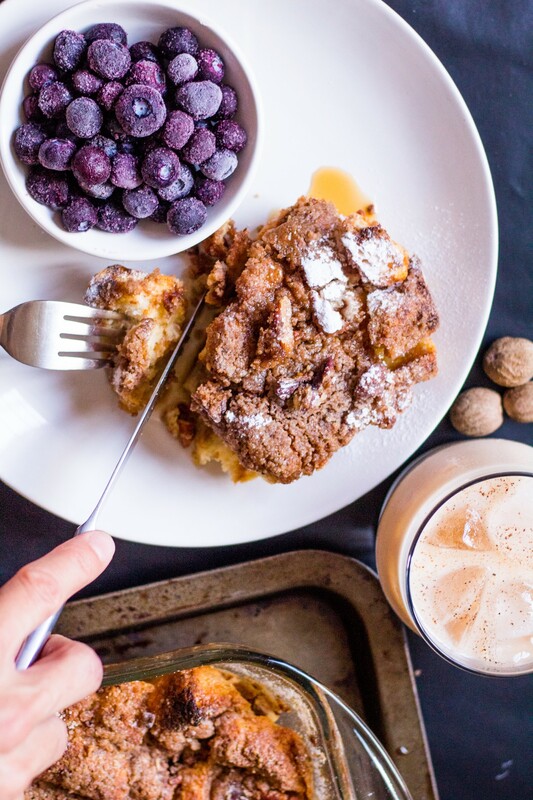 The beauty of it is that It’s the same French toast but you can make it ahead of time. No need to dip toast individually and stand by he stove and cook each piece, and it feeds and pleases a crowd or in my husbands case it can feed him for a few days. I love to make it on holidays when you are having a slow morning and can actually sit and enjoy a long breakfast and a few cups of coffee. 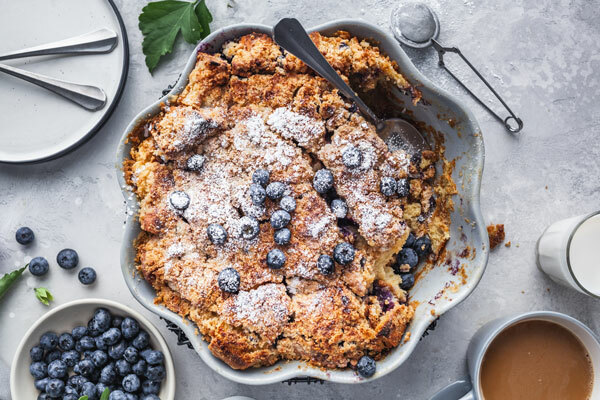 It’s the perfect thing to make if you have guests staying with you too. 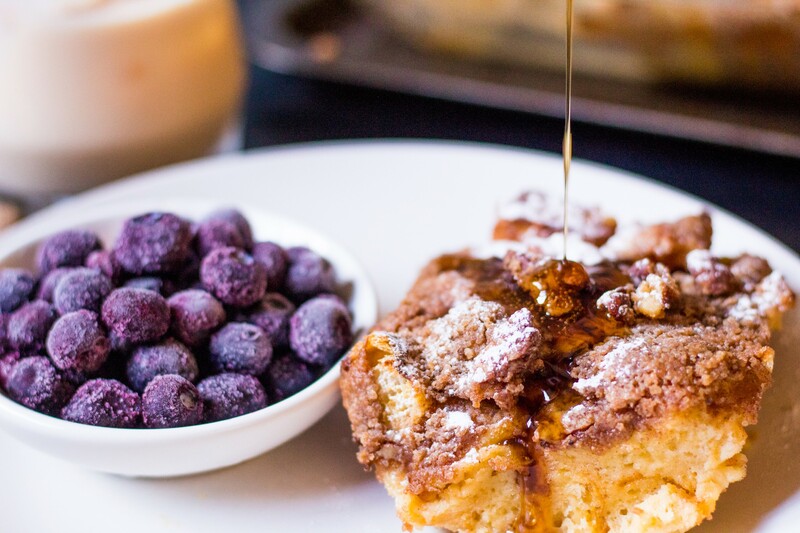 Always a great treat to wake up smelling this beautiful French toast baking. I also love to make it when we are away with a group for the weekend. It makes for a wonderful addition to a brunch menu. Just add a fruit salad and lots of maple syrup, bacon and strong coffee and you have the most perfect brunch and you didn’t have to slave over a hot stove for an hour dipping and flipping your toast. 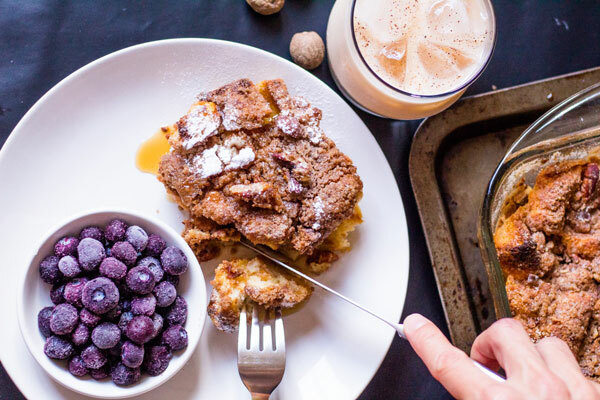 What’s better than overnight French toast? Well boozy overnight French toast of course! I really don’t crave eggnog but I do enjoy ponche de creme which is basically the Caribbean’s version of a boozy eggnog. Definitely the addition of a good dark rum makes all the difference. Here’s a basic recipe for ponche de creme as well as my basic recipe for overnight French toast. I say basic because I use it often and add things to it as I please. I love to add blueberries to it or other fruit. You can make it chocolatey and add nuts to it too. So give it a go and hope you enjoy! Make sure to add loads of maple syrup and serve it with a side of ponche de creme! Stir the mixture well before serving and serve with a dusting of grated nutmeg and over ice. For the French toast: Grease the baking pan with butter. Tear the bread into chunks, or cut into cubes, and evenly distribute in the pan. Crack the eggs in a big bowl. 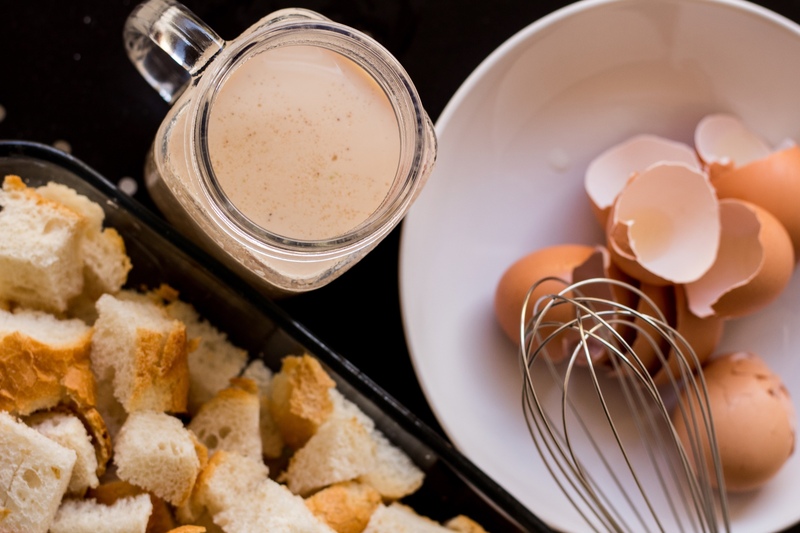 Whisk together the eggs, milk, cream, granulated sugar, brown sugar and vanilla. Pour evenly over the bread. Cover the pan tightly and store in the fridge until needed (overnight preferably). For the topping: Mix the flour, brown sugar, cinnamon, salt and some nutmeg in a separate bowl. Stir together using a fork. Add the butter and with a pastry cutter, and mix it all together until the mixture resembles fine pebbles. Store in a re-sealable plastic bag in the fridge. Serve with maple syrup or your choice of pancake syrup and enjoy! !